You know what I love? Free samples at the supermarket. I was in the beer section at my local New World when a dude from Ora brewery offered me a sample of this very beer. I enjoyed it so much that I picked up a six pack (other breweries should take note). 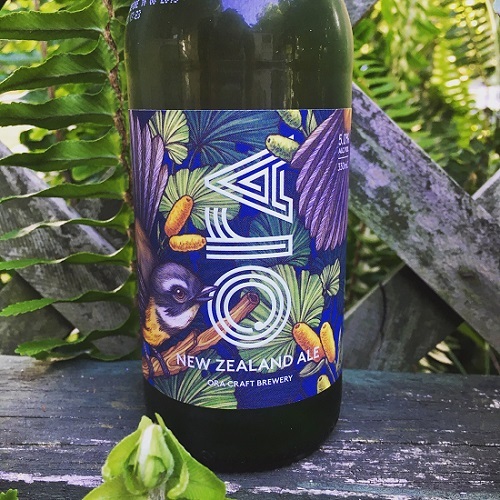 Blurb on the bottle: Ora catches the fruity aroma of native spices harvested traditionally from the forest of Aotearoa, brewed with fine malt and the soft smooth taste of New Zealand water, served chilled. The review: This is a tricky one to write about. I don’t think I’ve had a beer like this one before. Ora’s New Zealand Ale is herbaceous, botanical, and kind of funky tasting. It’s also smooth, crisp, and refreshing. It’s a good barbecue or lawnmower beer – supremely quaffable, not too challenging, with medium carbonation. And how about that label? It really is a thing of beauty. It makes me want to drink this beer outside in the great outdoors. Maybe not in the bush, but certainly on the beach this summer. The verdict: Ora New Zealand Ale is ka pai! Beer/movie combination: I finally watched Ant-Man and the Wasp this week. When it first came out, I think was suffering from Marvel fatigue following Avengers: Infinity War, which is why I didn’t go see it in the cinema. I wish I had now, because it’s good.